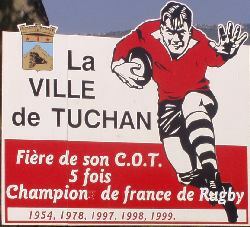 Tuchan is a Rugby town and the home team have been French champions five times; the last occasion being 1999. 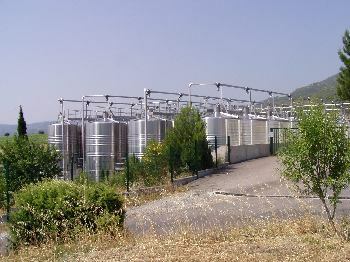 It also produces Fitou wine. A large supermarket chain in the UK stocks Fitou wine and all is made in the Cave Cooperative at Tuchan or Les Producteurs de Mont Tauch. Tuchan lies in a plain and bordered to the west by Mont Tauch which at 900 meters dominates the town. It has always been productive but whereas you might at one time have seen flocks of sheep or goats wandering around and cereals being cultivated you can now only see varieties of vines like syrah, carignan, grenache, muscat all growing in orderly rows. 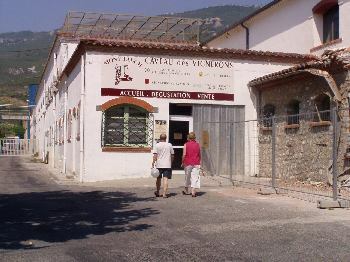 The town lives off the grape and its current relative prosperity is due to the success of Fitou wine and the successful marketing by the Mont Tauch Co-operative. 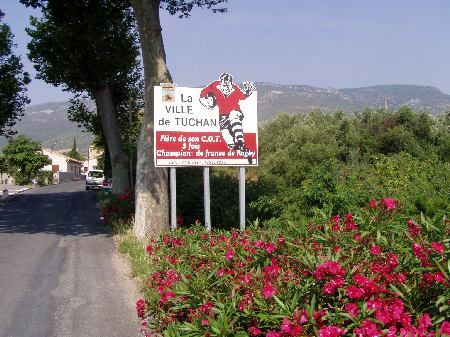 Tuchan has the atmosphere of a border town with Mont Tauch rising bleakly to the west and the Tramantane wind blowing strongly through the narrow streets. The old border between France and Aragon, and Spain, guarded by the Châteaux of Queribus and Peyrepertuse is only a few kilometres away. The town and its surrounding area has been lived in and fought over for a very long time. In the nearby village of Tauteval, a skeleton of 400,000 years old was found. 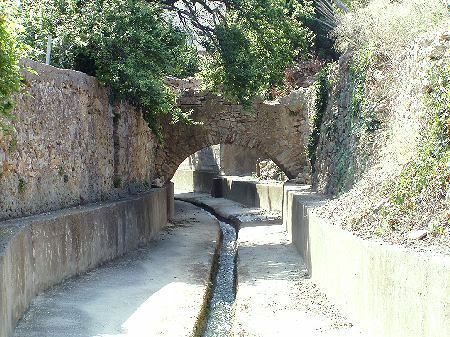 At Château Nouvelles, 2 kilometres, to the north (where very good Fitou wine can be bought) an old roman road, the via Mercadaria, passes close by. The Romans were here mining the iron, gold, silver and lead. 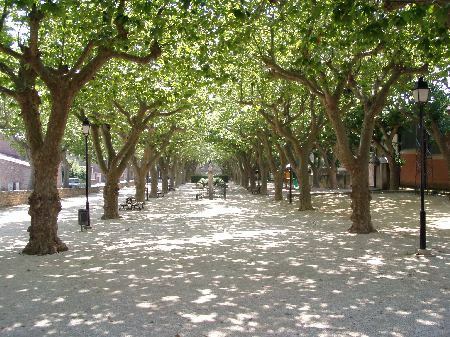 Narbonne, a major Roman port on the Mediterranean coast, now the sous-prefecture for the Aude, is 45 kilometres away. The town has seen violence both natural and man made. In 1311 some 133 heads of families paid homage to the Abbey of Fontfroide and the total population could be counted in hundreds but just 60 years later the number of families paying tax had dropped to 26. The population had been devastated by the plague. From the middle of the 15th century until the mid 17th century and the signing of the Treaty of the Pyrénées, which finally settled the border between the two countries, the town was repeatedly invaded by armies from Spain. 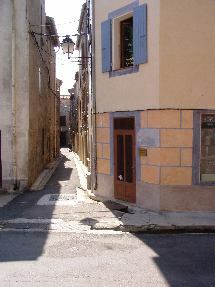 In 1525 the villagers were taken to Perpignan as hostages and were only freed when ransom money was paid. 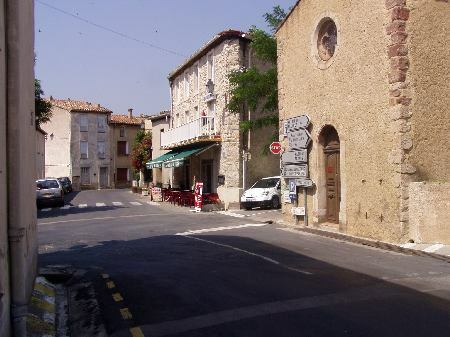 Battles now are fought out on the Rugby pitch and for the most part the town is a sleepy village coming alive for the village Fêtes in August when live bands play amplified music in front of the Mairie and the town dances until the early hours of the morning. Tuchan is a working village. 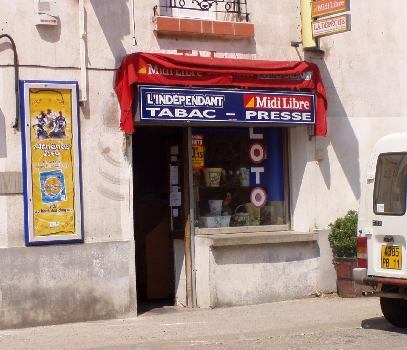 There are pretty corners and unexpected views but in the narrow streets you are likely to meet a tanker lorry or an international delivery lorry come to collect wine for distribution throughout France and Europe and be squeezed to the side of the road as it passes by. 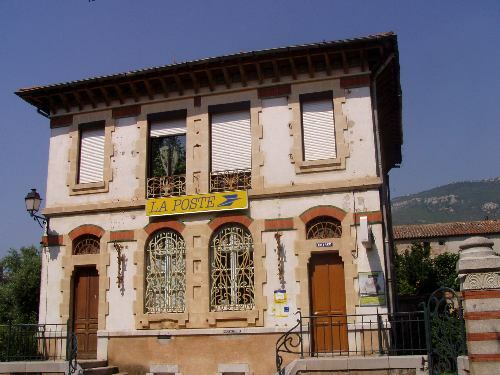 The Post Office, a handsome Art Nouveau building, is a protected historic monument as is the Château d'Aguilar which lies just outside the town. You can walk to the Château from the town and follow for a few kilometres one of the Grande Randonnée routes Le sentier Cathar which begins at Port La Nouvelle on the coast and finishes at Foix in the Department of the Ariège. Aguilar dominates the Tuchan plain and would have been built to control the routes. Today it is described as a Château Cathar but it never was occupied by Cathar sympathisers in the 11th and 12th centuries when the crusade against these heretics was waged by the Catholic Church and the Kings of France. Tuchan and the surrounding area is walking country. You can go by car to visit Aguilar, and drive to the top of Mont Tauch where you will be able to inspect at close quarters the wind generators built to help reduce France's dependence on nuclear fuel for generating electricity, but if you follow the marked paths you will be able to absorb more slowly the atmosphere, the scents, and the spectacular scenery. © 2004 (Text and Photographs) Maggie Comley, (deceased). Copyright : © 2004-2014, Peter Mottram - All rights reserved.